"Follow the path you truly believe in! That is what it means to be a Fairy Tail wizard!" This is the tale of Lucy Heartfilia, a seventeen-year-old girl seeking to become a full-fledged wizard (or mage, if you'd prefer, though it's officially translated as "wizard"). In a magic world ruled by guilds, becoming a full wizard requires you to join one. When Lucy meets a boy named Natsu Dragneel, who also happens to be the well-known wizard Salamander, he invites her to join one of the most notorious wizard guilds—Fairy Tail—which she accepts. Their adventures continue as they do missions for the guild, struggle with problems from the past, fight world-threatening villains and learn The Power of Friendship. A manga by Hiro Mashima, the man behind Rave Master, consisting so far of seven major story arcs and several minor ones between them. Its art style and themes are quite similar to One Piece, although not to the point of being a carbon copy. 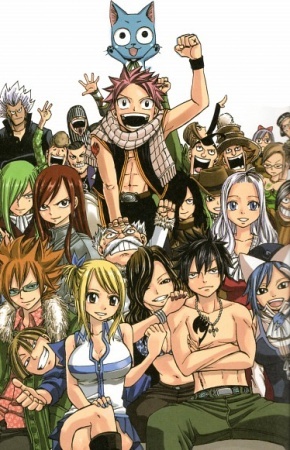 Fairy Tail has been adapted into an anime, and is licensed by Funimation. Licensed episodes are available to watch on Hulu [dead link] and on Youtube. A movie is also under way. Natsu, Lucy and friends appear in the Massive Multiplayer Crossover game, Sunday VS Magazine Shuuketsu Choujou Daikessen. Not to be confused with the Fairy Tale genre (by the way, Word of God has stated since the beginning that the spelling of the name is intentional). For the sake of keeping people from getting confused, please refer to the official English spellings for all character names. Due to to page length, this page was split into subpages.